This is an up-to-date and comprehensive reference work on sinonasal and skull base diseases. 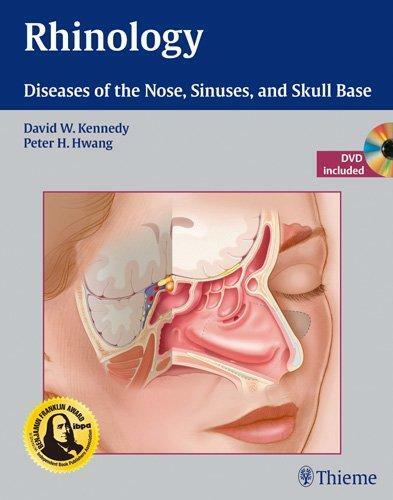 It is the natural successor to Disease of the Sinuses: Diagnosis and Management (Kennedy, Bolger and Zinreich), published in 2000. The text is supported by excellent illustrations, clinical photographs and an accompanying DVD which contains 21 videos of various surgical procedures. Kennedy (Perelman School of Medicine, University of Pennsylvania) and Hwang (Stanford University School of Medicine) have joined forces to shepherd the contributions of a long list of international experts. There are sections on sinonasal anatomy and physiology, medical aspects of sinonasal disease, and surgical aspects of sinonasal and skull base disease. As with most multi-author books, there is an eclectic mixture of writing styles and inevitably there are areas of overlapping content, such as the Draf III procedure which is covered in both chapters 27 and 28. However, it must be said that the vigilant, firm editorship has kept this to a minimum. There are some areas where the text falls short; for example, chapter 35 has impressive illustrations of the chapter author’s preferred techniques (e.g. lateral suture suspension of the nasal wall) but other common techniques used to address nasal valve collapse have not been adequately discussed. The video clips each last about 30 minutes and are narrated by Dr Kennedy. They are largely excellent in terms of their educational value, with discussion of key surgical tips and pitfalls, but there is significant variation in video quality which is disappointing in this era of high-definition video-capture. In summary, this work represents the accumulation of a tremendous amount of knowledge and experience from numerous experts in their fields, and all authors must be congratulated on the quality of the final product. The use of this multimedia reference is highly recommended to all otolaryngology and neurosurgical senior registrars and consultants alike.